Product marketing focuses on knowing your customers’ needs and the problems your company or product can solve. The PMM informs your company about your customers and the best products to serve them. The team connects your customers to the goods and services you develop based on that audience data. As a PMM, you are on the cutting edge of growing your company through new products. This is perhaps the most critical hire in marketing: As Jascha Kaykas-Wolff, Mozilla’s CMO, told Inc. Magazine, “If I were a marketer re-starting my career, I would start in product marketing.” This article will give you a comprehensive guide to the roles and responsibilities of product marketing, as well as some of the tools and templates you can use to implement product marketing in your organization. What Does Product Marketing Do? What Is the Value of Product Marketing? Do You Need Help in Product Marketing? While all departments in a company may think about customers, product marketing puts the customer at the front and center of everything it does. The goals of traditional marketing include building brand awareness, growing new markets or audiences, and even strategic communication. By contrast, product marketing focuses solely on existing customers and keeping them happy. To succeed, you need deep knowledge of who your customers are, what they want, what influences their decisions, what problems they need to solve, and how they perceive that your business can provide a solution. Keep in mind that, while it seems as though people buy products, they are actually buying solutions to their problem. So, knowing their problem enables you to build and market the best solution to that problem. Having this expertise gives you an influential voice in shaping the goods and services your business provides. Product marketing works with product development and the marketing and sales teams to plan the packaging, features, pricing, and promotion of the end of product. Because the work of product marketing crosses so many areas of a company, product marketing can be aligned with product development, product management, and sales and marketing. The most successful product marketers learn to work across departments, regardless of the official structure of their company. According to David Fradin, an expert Product Leader, Product Manager, and Product Marketing Manager, product marketing emerged in the 1930s at Procter & Gamble as brand management. Over the years, the duties of the brand manager have evolved into two roles: the product developer and the product marketer. By 2015, 84 percent of the companies surveyed by Regalix Research said they invested in product marketing. You can read more from Fradin in his books: Building Insanely Great Products available now and Foundations in the Successful Management of Products, available soon from Wiley. Product marketing brings many benefits to your company. By identifying the right product and getting it to the right customers, product marketing drives sales and profits. Using customer data wisely also helps your company develop new products, as well as create smarter overall marketing strategies. In an increasingly competitive (and innovative) marketplace, product marketing is your key to success. For start-ups, your company is your product. Product marketing is really marketing for your entire company, since the only way you can grow is by knowing your audience and knowing how your product meets their needs. At the B2B level, product marketing faces additional opportunities and challenges. According to Kapost article by Gerardo Dada, VP of Product Marketing and Strategy at SolarWinds, B2B buyers are 57 percent through their purchase decision-making before they ever talk with a sales representative. The challenge is that purchasing decisions with B2B customers are made by a range of stakeholders, from CEOs and other C-suite executives, to sales and marketing teams. The opportunity here is to demonstrate the value of your product in a way that deepens the relationship with your customer—and can’t be duplicated by the competition. As your business grows, product marketing gives you key insights into which new products and services you should add. With consumer insights, you will be able to identify needs in the marketplace and create a successful strategy. In an innovation economy, your skill at anticipating your customers’ needs (whether B2B or B2C) will help your company survive and thrive. In the digital age, customers can go anyplace, anytime to find new products and services to meet their needs - you must be one step ahead so they consistently turn to you to solve their problems. As noted earlier in this article, product marketing started as brand management and works directly with product development. While the two roles work together, they have different areas of responsibility: Product management focuses on the product and its features and requirements, whereas product marketing focuses on the customers who will use the product. Who Uses Product Marketing Plans and Strategy? Because product marketing is at the heart of connecting the customer to the product, everyone from CEOs to engineers and salespeople relies on their work. Internal communication across and among departments is just as important as the external messaging to customers. Everyone needs to understand the key messaging and be on the same page. Your messaging builds a strong connection among all the stakeholders in the company who are committed to the product’s success. It’s important to get approval and buy-in from key stakeholders. Once you’ve got it, you’ll find it easier to get the necessary resources and generate excitement about your work. It’s also important to make sure all the stakeholders have what they need. A CEO may not need the sales brochures and spec sheets that your sales staff relies on in the field. The engineers may not need the strategy overview that your CEO reads. With a solid product marketing plan, you can keep everyone on message while making the relevant materials available without wasting their time. Decisions about audience, features, and pricing are made by people who don’t have the data or understand the market. Products are developed and put into the market without a launch plan or a budget. Sales staff have to create their own collateral and spec sheets. Your company doesn’t have relevant data about its customers, market share, and sales. The role of marketing is simply to write web copy or social media messages or design brochures. Don’t hire product marketing professionals simply to help your overworked product development team get the product finished. The jobs, while related, are not the same. Product marketing will not make the product faster. It will make the product better, because they understand what your audience needs. A product marketing strategy goes hand-in-hand with the product strategy — the plan that identifies and defines what you want to accomplish. A good strategy points everyone (from the CEO to engineering to sales and customer support) in the same direction. It keeps you focused on your customers and your market. It’s your guide to working together on what matters most. A product starts with your organization’s vision. The product must sit squarely in the strategic vision of the organization. That vision feeds the development of the product and conveys energy and excitement to your customers. It outlines your customers, what they need, and how you will address those needs. You might even get a sense of the life cycle of the product, what it could become and when it might reach its end stage. Your Competitors: What companies are offering what you want to offer? (Find at least the top three.) How will your product be different? What makes it unique? Who are their customers? What problems will your product solve for those customers? Competitive research, also known as a market review, is key to your success. Learn more about conducting a competitive analysis. Your market position: How will your product offer value? What is the real problem that your product solves? What are your strengths and weaknesses? You may have had a rough idea of how you wanted your product to function. Armed with these insights, you can nail down all the details that will make customers happy and drive your business forward. You will be able to speak with confidence about the specific product functions that meet the consumers’ requirements — from features and colors, to additional services and warranties. The product description you craft tells the story of how this product meets your customers’ needs. Management guru Peter Drucker is often quoted as saying, "You can't manage what you can't measure." That’s not only true in the C-suite, but also extends to every product and department in your company. Once you’ve defined the product, it’s time to define what you want to achieve. Without goals, how will you know whether your product succeeds? Use simple, clear, and precise goals (whether it’s improving your market share, re-engaging with customers, or driving revenue) to keep on track. Keep in mind that the product goals don’t stand alone. They need to align with your company’s strategic and business goals. After all, your product is part of the company’s success. For more information on writing SMART (Specific, Measurable, Achievable, Relevant, Time-Bound) goals, read this article. Finally, ask how this product fits with the initiatives of your business. Your product may be a better mousetrap. It meets customer needs by making them feel safer with fewer mice. (They buy solutions, not products.) The product also addresses the company’s initiative to move into new neighborhoods, territories, or areas. You can map your product’s features to the larger initiatives of your company. Market Penetration: The combination of current products and current market. Your product marketing strategy focuses on increasing your market share and getting existing customers to use more of your product. Market Development: The combination of current products and new markets. Your product marketing strategy focuses on new audiences and communities with different packaging and pricing. Product Development: The combination of new products and current market. By listening to your audience you stay ahead of your competitors, developing new and innovative products. Related diversification means you develop (or buy) products that are related to your current offerings. One example is the line of beverages that Coca-Cola offers. There’s one more way to think about diversification: Horizontal (buying companies that are your direct competitors or are directly related to current products) and vertical (buying the suppliers and distributors of your product or developing your own channels). Each of these strategies has risks and rewards, so your decisions should be based on a solid understanding of your audience and your competitors, as well as an examination of your business strategy. What are our revenue goals for the next year? Overall and by product line? What resources changes will be made in the coming year, including marketing staffing and budget? Do we anticipate any strategic partnerships, mergers or acquisitions? In which existing markets do we want to grow? What existing markets are we willing to move away from? What new markets do we plan to pursue? What existing services do we plan to maintain and improve? Which are at the end of their life cycle? What new products are being discussed? What are the biggest challenges we will face this year? Once you’ve mapped out your product’s essentials, it’s time to create the go-to-market plan that guides how it will be promoted and sold. This launch plan covers everything from developing the pricing and messaging for the product to creating training materials for your sales staff. It keeps everyone on the same page and makes sure that your team is ready when the product is ready. The plan also spells out timetables, release schedules, resources, and tasks. Product: While you will spell out the unique designs, features, services, and other elements that describe your product, your marketing plan covers more than the details. It’s a positioning statement that defines what makes your product different. Price: When you set your pricing, you need to consider several factors. First, you know how much it costs to make your product. Then, you need to know how much value customers will assign your product. Consider marketplace conditions: Is your product in high demand? Are there a lot of competitors who will respond with pricing strategies of their own? What kinds of discounts, sales, payment periods, or other terms can you include with your pricing? The bottom line is that your product is only worth what your customers are willing to pay, so make sure you understand your product’s value in the marketplace. Place: Place can mean the brick-and-mortar store where customers find your product, but it also extends to include all the distribution channels you use to get your product to your customer. (Software startups, for example, typically sell online.) Delivery methods vary widely depending on the product, but the goal is getting your product into the marketplace. Promotion: This may seem like the most natural part of product marketing. Promotion includes all the channels and methods you will use to reach customers about the value of your product. Tactics include advertising, sales, events, email marketing, content marketing, social media, and more. Every aspect of your promotion is centered on your product messaging. Process: Think of process as the pipeline for your product. This is especially important if you deliver a service. For a startup, the first product launch has several benefits. First, you get your product into the marketplace. Then, you also learn how to improve your process in subsequent product development. For any company, the process always reveals your strengths and your opportunities for improvement. People: The people behind your product are critical to marketing the product. From the engineers and product development team, to sales and support, your success depends on your people. Do you have enough staff to handle the launch and product fulfillment? Have you given your sales team everything they need to explain what sets your product apart? Physical Evidence: Successful product marketing fosters a superior customer experience. How does your messaging shape the perception of your product, whether it’s in a store or online? The consumer experience could be the biggest differentiator of your product. The Four Ps are business focused, but product marketing is customer focused. To accommodate product marketing and put the customer ahead of the seller, the Four Cs approach was developed in the 1990s: Customer, Cost, Convenience, and Communication. Customer Solutions, Not Products: Customers want to buy a solution to their problem, not simply purchase a product. Cost, Not Price: What is the value of the product to the consumer, and is the price point something they are willing to pay? Convenience, Not Place: How easy is it for customers to find and buy your product? Communication, Not Promotion: Promotion is one-way messaging from the company to the consumer. By setting up social channels and other ways for customers to offer feedback and insight, you create value and loyalty. In addition to a sales guide, you should develop data sheets, training materials, and other collateral that your sales team can use to take your product to your audience. Product development and product marketing have to work in sync so both are ready simultaneously. Imagine releasing a product and not letting your customers know it’s in the market - you won’t get many sales, and you also can’t create positioning statements that are inaccurate about the product’s features and benefits. Either way, you are alienating yourself from your customers. Customer satisfaction is your primary goal, and one you can share across departments to help you achieve it. David Fradin is a Distinguished Professor of Practise and Advisor, and Product Management Programs at Manipal Global Academy of Information Technology. He is also the author of Building Insanely Great Products and the soon-to-be-released Foundations in the Successful Management of Products, available soon from Wiley. Fraudin thinks the biggest change in the role of product marketing is the advent of social media and tools to manage social media. Now that you know what it takes to create a marketing plan, you’ll need a tool to loop in all the key stakeholders, centralize important information, and create an interactive plan that can evolve along with your product. With multiple channels, competing priorities, and never-ending requests, leading marketers rely on Smartsheet as their work management solution to strategically plan, report on programs, and coordinate vendors and teams. Smartsheet is a work management and automation platform that enables enterprises and teams to work better. Use Smartsheet to boost accountability by maintaining consistency across channels and campaigns, save time with centralized resources, and increase campaign speed to market. Plus, create a custom dashboard with Smartsheet Sights to monitor campaign success and view performance metrics in an intuitive, easy-to-use interface. Seamlessly connect marketing efforts to ROI, accelerate delivery of marketing initiatives, and improve alignment with internal and external stakeholders. Extraordinary marketers rely on Smartsheet for campaign management, initiative tracking, content calendars, event management, and more. 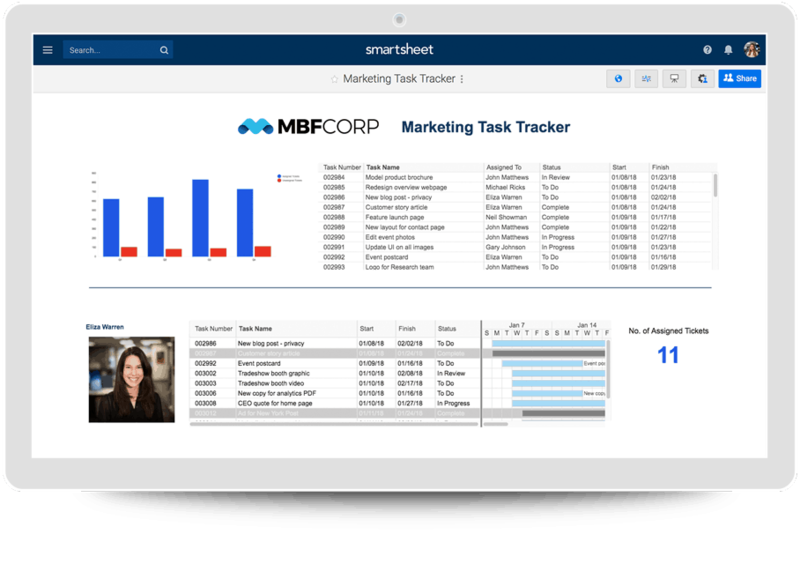 Discover all the ways Smartsheet can help with your marketing efforts today.